If you are visiting the Elephant Coast in KwaZulu-Natal between June and December, you could enjoy one or both of these activities. Whale watching and Turtle safaris are seasonal highlights in the iSimangaliso Wetland Park. The Elephant Coast offers a sunny and serene holiday destination for the whole family. Nature's many miracles can be witnessed in pristine surroundings. The beautiful coastline stretches for miles and is shaped by the warm Indian Ocean. You can enjoy a huge range of activities on land and sea, but Whale watching by boat and Turtle safaris rank as top attractions amongst visitors. Every year between July and December Humpback Whales and Southern Right Whales migrate along the coast. They travel north to Mozambican waters and then come back again on their way south to Antarctica. Of the 2 species, the Humpback Whale is the most commonly seen.Humpback Whales are curious and playful as well as acrobatic. Do you know that each Whale's tail has unique identifying marks and that a Whale can weigh as much as 10 Elephants? The best way to see these giants of the deep is on a boat tour.The excursion takes about 2 or 3 hours and only operators with a legal permit can get within 300 metres of a Whale. Female cows and calves cannot be approached at all. On the excursion you could see a Whale leap out of the water a mere 50 metres from the boat or watch it swimming alongside you. 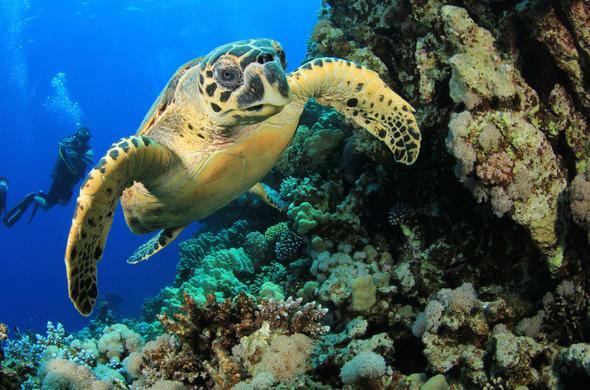 Other species seen in the water include Marlins, Dolphins, Turtles, Sharks and Whale Sharks. iSimangaliso Wetland Park provides a marine sanctuary for many aquatic species including one of the oldest, the Sea Turtle. The coastal waters are visited by 5 turtle species but the Loggerhead and Leatherback Turtles are the only ones that breed here and lay their eggs on the protected beaches. iSimangaliso provides the only viable coastline in Africa for major nesting sites.Usually between late October and January and even into March in some areas, pregnant female Turtles emerge out of the sea in the dark and proceed to lumber onto the beach once they have checked all is well from the tide line. When suitable sites have been selected they begin the arduous task of digging a deep hole in the sand, laying the eggs and then covering them up again before crawling back to the sea.Turtle Nesting Safaris are guided beach walks that take place at night. Strict rules are followed with regard to any activity in the vicinity and the actual approach to the nesting site. Bright lights and noise are not allowed and you can only follow your guide to the spot once the Turtle has entered a trance-like state in the egg-laying process. Do you know that that these females return to the same beach on which they hatched many years before? No-one knows how they do this.